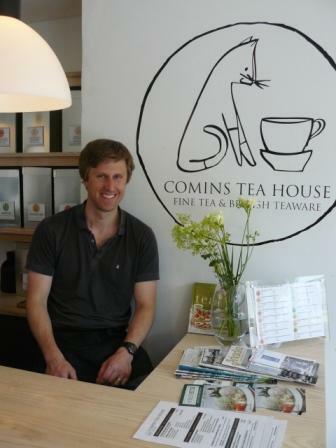 In honour of the Eat Dorset Food Fair coming to Beaminster soon, we thought we’d post a little story about one of the many exhibitors who will be at the fair – and tell you a little more about a tea-drinking experience we recently had, at the Comins Tea House. They may not be Beaminster-based, but hope that you will indulge us this, and take the opportunity to meet Rob and Michelle at the Food Fair, taking place at Parnham House in Beaminster. On a sweltering summer’s day, where most people seek shade and swimming pool relief; where the allure of melting ice cream cones and suntan lotion seems to be the activity du jour, you wouldn’t be to blame should you happen to find yourself in the heart of the Blackmore Vale, and more specifically in the sprightly little town of Sturminster Newton, drinking tea. Across the bridge, just on the hem of the town, lies a beautifully restored Georgian building which is home to Rob & Michelle’s Comins Tea House, a tea-sanctuary that welcomes all visitors that walk through the door with muted scents of faraway lands and abundant hospitality. The tea shop, which has been open for just over a couple of months, is the result of a life story filled with tales about travel to distant lands, chance meetings of tea barons, a tea lover and her previously not-so-tea-loving husband who meets and develops a new appreciation for the stuff that he, like many others, only believed was really necessary to serve with milk and two sugars: a true love story and new appreciation for a traditional British icon – the cuppa. It doesn’t’ matter if you don’t know your Assam from your Matcha, your Oolong from your Sencha, Rob and Michelle’s gentle approach to tea, and the ceremony behind serving tea, is infectious and captivates you, the minute you sit down. For those who may feel slightly overwhelmed by the variety and choice of what seems to be so incredibly foreign, the Comins Tea House team are focussed on educating and guiding even the sternest of sceptics, through a tea experience which is sure to be memorable. You may opt in for a Lishan Spring Oolong Tea from Taiwan, served according to the Gongfu (also known as the Kung Fu or Chinese Tea) ceremony. This gently floral, caramel sweet tea ceremony comprises of several steps which include the awakening of the tea leaves, an infusion of the tea for an initial 45 seconds and thereafter served in traditional Chinese clay tea cups. Or, you may decide to be more adventurous and wonder over towards the Macha Japanese Green tea – where the tea is milled for 18 hours into a fine powder, water is added, and the mixture is whisked up into a green frothy tea and served. 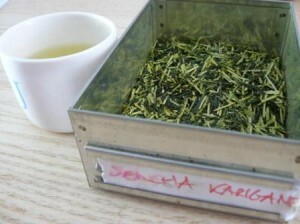 But nothing beats a hot summer’s day than an ice cold brew of Sencha green tea. As you enjoy this chilled and refreshing green Japanese brew, Rob explains the difference between brewing the tea with hot water and then chilling it, verses the proper method of placing as much ice as possible on top of the tea leaves, in a large glass jug, adding chilled water to the brim of the jug, and steeping until it seems ready, which could be at least 5 hours. 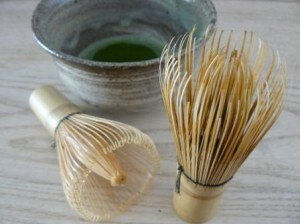 Matcha tea is made from a fine green powder and whisked up into a frothy pot of heaven. 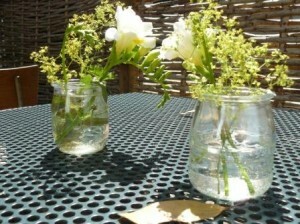 Visiting the tea house may also give you the opportunity to meet a regular visitor called Chris. A local resident of Sturminster Newton, who spends most of his time on the road, describes the first time he ventured into Comins Tea House. Having wondered past the front door of the tea house on several occasions, he mentions his apprehension at being invited to attend the grand opening day. With fears that he would have to rub shoulders with experts and professionals who could taste essences of oak and honeysuckle in their Da Hong Pao tea, or hints of kelp and earthy dragon fruit in their Long Jing green tea, he decided on a slightly less intimidating visit. He sits at the corner table, with the morning sun drifting in, he seems relaxed and peaceful as he takes another sip of his Houjicha and tells about the first time he ventured through the front door one morning and how Rob and Michelle helped him to explore numerous tea varieties until he found his perfect match. Rob and Michelle are hands-on hosts, but not at all intrusive, and Rob muses over how much he enjoys witnessing the change in people’s perceptions of tea, much the same as his perceptions were shaken years ago. Visiting a tea shop like Comins, you cannot help but question your own experience, love or distaste of tea and the circumstances that have lead to the conclusions you have drawn about it. Whether your experience of tea includes long conversations around the kitchen table, or whether it serves as a bed-time confidant, tea has almost always been in our lives. Time seems to stand still at Comins Tea House, and for a few moments, the hustle and bustle of normal life seems to fade away. Rob tells of their journey that lead to the opening of Comins Tea House, detailing the hours of his own labour put into renovating the building, the bespoke local Ash tree counter that he created himself, the vintage school chairs sourced from an antique dealer in Cornwall, and the creation of each and every table, and doing all of this while being dad to a 3-year old and a pair of twin newborn girls. He talks about the inspiration behind the Comins Tea House brand, their Siamese cat called Anders who liked to drink whatever was left out, and points to the photo on the wall of Anders musing over a cup of what appears to be a light green brew. As the River Stour meanders its way around Sturminster Newton and the Dorset sun sets over a hill shrouded by a herd of lazy fresians, Rob and Michelle Comins prepare for their next project. You may meet them at the next country fair, or you may even have the chance to sample their tea in a local restaurant, but should you have a few hours to spare, and you’re in the mood for a different, yet subtly comforting experience, meander your own way to Sturminster Newton and pop into the tea house. You never know, Dorset may just introduce you to your new favourite Darjeeling. 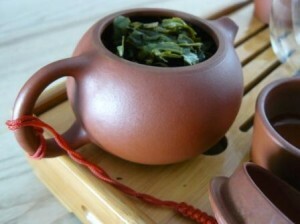 For more information about Comins Tea House, please click here. To know more about the Eat Dorset Food Fair, please click here.